Another Art Sherpa inspiration piece in acrylic. My phone didn’t quite get the colors and highlights right, especially the hair. But I like the painting in person. 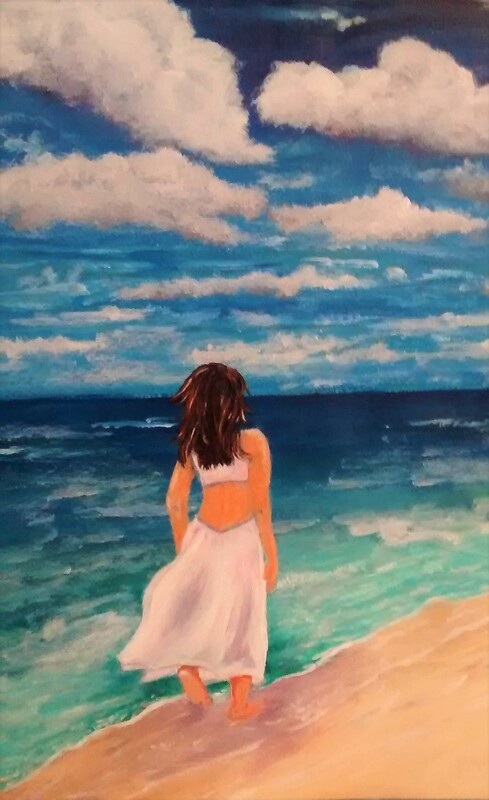 Categories: art, blogging | Tags: acrylic painting, art, art sherpa, Beach, blogging, E. G. Parsons, elizabeth melton parsons, image | Permalink. ❤ Thank you, my friend. Good technique, Elizabeth, and the work has an evocative atmosphere. I like how the head breaks the sky/water line and emphasises depth. Great painting, Elizabeth. The colours are soothing to the eyes. Lovely! I particularly love the way you have done the sky. Thank you, my friend. I changed it like 50 times so your comment makes me so happy. 🙂 How is your new life’s journey going? It’s going great so far, I will be out and about hiking soon but before then I will be attempting to catch up on all the travel posts and book reviews that need doing. It’s challenging in a good way and I am happy!